The massive layoffs that followed the financial crisis were both a cause and a symptom of the Great Recession, crippling consumer spending and spreading pessimism. By October 2009, during a month when the U.S. economy lost 190,000 jobs, the unemployment rate hit 10.2%. Job creation began to revive late last year, but in May, the government said the U.S. added only 58,000 jobs, and layoffs may be on the rise again. Layoffs among state and local government workers are the most obvious source of new unemployment. Large cuts have started in regions as diverse as Jefferson County, Ala., Detroit, and Pennsylvania. These downsizings have affected police, teachers, and administrative personnel. 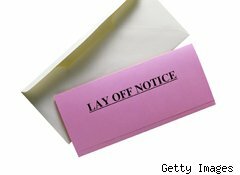 In Detroit, the number of public employee layoffs could rise into the hundreds. And government job cuts may have only just started. Budgets in large states including California and New York are still not balanced, and state deficits are running in the billions of dollars. Austerity plans being proposed in Washington will probably cost jobs among federal government employees as well. What might be of more concern to economists is that layoffs have begun to reappear in the private sector, and that trend may grow with the economic slowdown. Walt Disney (DIS) recently downsized workers. So did Boeing (BA). Lockheed Martin (LMT) this week announced a plan to cut 1,200 people this year. A recent Gallup poll showed job worries among the top concerns in the U.S. "All major subgroups of Americans thus far in 2011 have named either 'the economy' or unemployment as the nation's top problem," Gallup reported. The NFIB Research Foundation, an arm of the National Federation of Independent Business that tracks small business trends, reported recently that many firms with modest numbers of workers plan cuts this year. Layoffs are not near the fever pitch that they were three years ago, and they will almost certainly not reach that level again anytime soon. But, it appears that high commodities and fuel prices, along with lower manufacturing and modest retail activity, have caused a new spike in job cuts. If the economy slows in the second half and austerity is Washington's solution to the federal deficit, joblessness will get worse.